Don’t try to see too much—With so much natural beauty and fascinating history surrounding you, it’s tempting to attempt to see it all in a single trip. Rather than trying to experience everything, aim to spend a few days in Athens and then plan to visit no more than two Greek islands. This allows you to relax and soak it all in. Do know your way around—It’s not unusual for public transit workers to strike, especially during the summer. Since there are no rideshare options in Greece, this can make a hurried trip to the airport a bad idea. Check with your hotel ahead of time for scheduled strikes. Better yet, go with a group travel company that provides convenient transportation to and from your destinations. Don’t forget about Lent—Clean Monday is the start of Lent in the Greek Orthodox Church, and most Greeks will avoid eating meat and meat products every Wednesday and Friday from then all the way up to Easter. During these 40 days, most restaurants are likely to offer mostly “fasting” food, which is typically vegan or vegetarian. Do carry some cash—Many small mom and pop stores still prefer cash, so make sure to have some Euros on hand. This is especially important when you are planning on taking a cab, since the taxis in Greece only accept cash. Don’t press your luck—Many Greeks believe that Tuesday the 13th is very unlucky, because that’s the day the Byzantine Empire fell. Do confirm the price of your cab—Before getting into a taxi, make sure to ask how much the ride will cost, and check that the meter is running. Also, be aware that most taxi drivers double their fares at night. Don’t go shopping mid-day or grocery shopping on Sundays—Keep in mind, most shopkeepers close for about an hour in the afternoon for a “siesta,” and most grocery stores and markets close on Sundays. 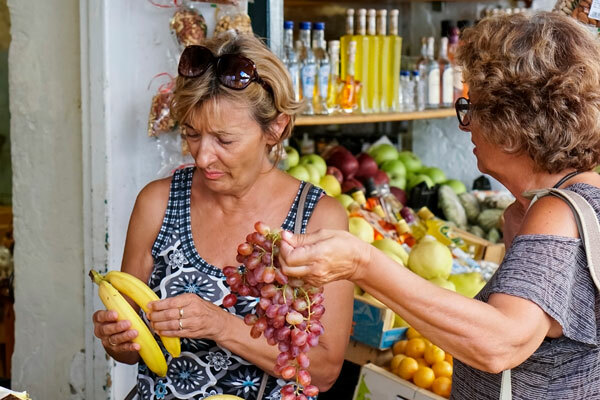 Do haggle—It’s an acceptable practice to bargain in Greece. While many stores have fixed prices, if you are buying several items there’s a good chance you can strike a deal. Do observe church etiquette—When visiting ornate Greek Orthodox churches and monasteries, women should wear long skirts or dress pants, and bring along a shawl or scarf to cover their shoulders. Do drink bottled water on the islands—Tap water is fine to drink on the mainland, but the water on most Greek islands is meant for bathing and household chores, and is therefore not potable. You can explore this ancient civilization on the Greece & Her Islands tour with YMT Vacations. Visit all the highlights on this 10-day land tour—from the original Olympic stadium to the Acropolis, the Parthenon to Delphi. To make your plans to join this exciting itinerary, call your travel consultant or YMT Vacations at 1-888-756-9072.